Quiet does not ordinarily describe my family. Usually we’re a chatty bunch and, in fact, we’ve even developed our own argot, “argot” being a word I just looked up that means we have a language that we’ve developed over time that is just ours and that might be incomprehensible to others. Isn’t the Internet wonderful? A large part of our argot is derived from movies, old ones in particular. For instance, I have been known to anger my husband on occasion. He, being particularly conflict avoidant, will not say, “I am really angry with you.” Instead, he will brood; leaving me to figure out what it was I said or did that has turned him into The Incredible Sulk. Frequently, I’ll know exactly what it was I said or did. Not being the kind of person who can live in I’m-Not-Talking-To-You Land for any length of time, I’ll rather sheepishly say, “You do despise me, don’t you, Rick?” Referencing Casablanca, I acknowledge my own despicable behavior and his understandable reaction. When my son was little, he watched Thomas The Tank Engine, another source for our family lexicon. Thomas, as you may know, is a rather small but dependable little engine. In short, very useful. His co-trains (what DO you call the animated trains that work with you?) include some much larger and far more egocentric engines. Chief among these is Gordon, a self-described “very important engine.” Gordon chuffs around all puffed up with his own grandiosity. Though our son’s Thomas trappings are safely stored in the basement, we haven’t retired the language. Calling someone a “very important engine” is so much more genteel than calling them an insufferable egomaniac. As amusing as my daughter is becoming, there is something I hope to never hear from her lips again. She has taken to playing hand-clapping games. I do not remember playing such games as a child, but then my fondest childhood memories are of sitting in the cool of the family room reading the encyclopedia while the other children frolicked in the summer sun. The words to my daughter’s favorite hand-clapping game are: “Double, double this. Double, double that. Double this. Double that. Double, double this that.” They are more mind invading than that stupid “What’s my name” song by Rihanna. Just typing the words has put them on endless replay in my brain. But, let me ask you a question. Will you forgive me if they get stuck in your brain, too? Yesterday, my husband and daughter were playing Monopoly while I was preparing the Father’s Day dinner. I make dinner every night, so it’s not a particularly stimulating event for me. I listened in on their conversation while I cooked the hamburgers, my husband’s idea of gourmet food. When my husband landed on Reading Railroad, my daughter, the banker, asked if he wanted to buy it. It was early in the game and he was collecting all the properties he could so he said, “Sure!” My daughter took his money. As she handed over the little railroad card, my husband sang, “I’ll be reading on the railroad,” obviously to the tune of “I’ve been working on the railroad.” I groaned. A few minutes later, my husband landed on the B&O Railroad, which he bought. As my daughter handed it over, he sang, “I’ll be smelly on the railroad.” This time I looked at him over my glasses with my “Really? You just said that?” face. He just grinned the goofy grin he always grins when he commits a crime of comedy. I don’t think my husband was always humor-challenged. I can’t recall any particular funny thing he said or did, but I have a vague sense that he was once witty. No longer. Now, he is the Baron of the Bad Joke. In fact, at least at home, groan-inducing commentary has become his signature comedic style. I do know exactly when my husband went from humorous to humor-less. The moment our son was laid in his arms, my husband’s funny bone broke. He started his slide into a life of comic crime by supplying lyrics to well-known arias related to whatever dad duty he was performing. Most notable of his alternative opera was the diaper-changing aria, sung to the tune of that “Figaro, Figaro, Figaro, Figaro” song. The words described the contents of said diaper, like this: “Poop-a-la, peep-a-la, poop-a-la, peep-a-la,” repeated until the task was complete. My husband is not the only man to be so affected by fatherhood. In fact, I have a theory that has been born out again and again. I am convinced that no man becomes a parent without also becoming a purveyor of the dreaded Dad Joke. Recently, my son’s guitar teacher became a dad. Before his transformation, he was a pretty cool guy. Heck, he’s a guitar teacher. Of course he was cool. Evidence of his turn to the Dad side was revealed at the first lesson following birth of his daughter. I think my son had been working on a difficult passage the week prior. On seeing his teacher, he jokingly said, “I hate you!” His teacher’s response? “Why do you dislike female sheep?” Groan if you will. It’s completely warranted. “Dad, you’re not funny,” has become the family joke. My son insists that my husband is funny outside of our home, though. The two of them visited my sister-in-law not too long ago. On their return, my son reported that his father had actually had his sister, her daughter and my son in stitches with some shtick involving our cat and his many misdeeds. My husband repeated the performance for me. I didn’t think it was funny. My son didn’t think it was funny. My daughter didn’t think it was funny. Even my husband admitted it wasn’t funny. I guess you had to be there. I’m pretty sure what’s happening at our house is that the kids are outgrowing Dad jokes faster than my husband can give them up. Saying, “Didn’t you have enough s’mores?” after a child has repeatedly asked for some more of something is a gut-buster when you’re six years old. At fifteen, such a comment is most likely to send the kid scrambling for Mom’s blog fodder note pad. Dad jokes are definitely intended for a general audience. My dad soothed more than one tiny soul with a well-timed ridiculous comment. I have very fond memories of being scolded. Actually, my fond memories are mostly of what happened after the scolding. I would run to my room screaming how much I hated my parents and how unfair they were for scolding me. I slammed and locked the door, intent on never again looking upon the face of anyone vaguely related to either of my parents, excepting me, of course. After a while, there would be a soft knock at my door. My dad would call my name. I would ignore him. He would call my name again. I would ignore him again. He’d ask me to open the door. I would ignore him yet again. Then, he’d start with the jokes. My resolve would slowly dissolve. Eventually, I would open the door, my dad would pick me up and I’d decide he wasn’t so bad after all. When my daughter was in kindergarten, her teacher developed a semester-long unit of study on Antarctica. Being the helpful soul that I am, I suggested the class sponsor a penguin. 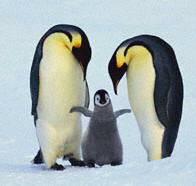 They’re cute, they live in Antarctica and they are endangered. The teacher agreed and the class collected money for the sponsorship. They sent the money off to whichever “Save Antarctica” organization it was that was collecting children’s pennies for penguins. “What penguin,” I asked, having forgotten the penny collection. “The penguin!” she said, vehemently, apparently believing that additional verbal force might force my brain into remembering. My daughter wasn’t trying to be cute. The penguin-saving organization called their sponsorship an “Adopt a Penguin” program. In our house, when you adopt something, you take it home and then you care for it and love it forever. My daughter was thinking it was about time we flew down to Antarctica and brought that penguin home, just as we’d flown to China to bring her home. I’m relieved that my daughter’s school didn’t adopt a highway. I don’t think it would fit in our living room. My daughter has been home for nearly eight years now and one thing I’ve learned in all that time is that people can be pretty darn stupid when it comes to adoption. Actually, people can be pretty darn stupid about a lot of things, but adoption really seems to bring out the insensitive jerk in a whole lot of people. We may get more than our share of stupid adoption comments because my daughter is Asian; my husband, my son and I aren’t. If you have eyes that work, it’s pretty evident that our daughter was adopted. My son is particularly annoyed by people who, on seeing him with his sister, ask if she was adopted. “No,” he likes to say, “my parents converted to Chinese after I was born.” I will admit, with shame, that I have used a similarly smart-assed response to one too many questions about how I came to be the parent of an Asian girl. Actually, asking if my daughter is adopted is annoying to me because no one ever asks me if my son is born. That sounds ridiculous, doesn’t it? My son was born, of course, but I’m really glad he isn’t born over and over again. Adoption, however, is something that many apparently believe happens repeatedly, as if my daughter wakes up every morning and we have to become a family all over again. She was adopted. It happened once, just like being born. Let’s move on, people. When my son was born, a switch in my brain was flipped and I became vigilant about protecting him. With my daughter, the protection factor went into overdrive. Perhaps it’s understandable, given the moronic comments adoptees must endure. Because society forces it on families built through adoption, we see potential adoption-related issues in every situation. Recently, a friend’s daughter confessed that she was very worried about being labeled different at her school. She was in tears over her anxiety. My friend assumed, of course, that her daughter’s adoption was at the root of the problem. Nope. Her daughter didn’t want the other children to know she doesn’t like pie. The real stupidity about adoption comes out over reality. I like to think of myself as real. I’m pretty honest and down to earth. Plenty of people have complimented me on how real I am. But when it comes to parenting my daughter, I become an imaginary being. Apparently, some people believe my daughter was adopted by fairies because I keep getting asked where her real parents are. Her real parents are right in front of you, Ding Bat, and we’ve got the papers to prove it. As put out as I get when someone asks the real parents question, it really ticks me off when I note that I am her real mother and I get, “Oh, you know what I mean.” No, I don’t know what you mean. I refuse to know what you mean. Because what you mean feels pretty mean to me. It feels particularly mean to me when it’s said in front of my daughter. Imagine telling a little girl that her father really wanted a boy. Or walk up to a kid and tell him that his mother wasn’t really sure she wanted to have a baby. Even if you know that little girl’s father really did want a boy and that mother really wasn’t sure she wanted to have a baby. You can’t imagine it, can you? But children who were adopted hear how their real parents didn’t want them all the time. They hear it from adult strangers and strange adults. Those are the easiest comments to deal with because I’m usually there when it happens. School, however, is another story. So I’ve given my daughter words to use in response. She lives with her real parents; her birthparents couldn’t take care of any baby so they made a plan for her to be adopted. I hope you’ll excuse me now. I have to go feed the penguin. I knew there were problems. Hell, everyone on our courtyard could tell there were problems. But I really didn’t think my lawn was so bad that the TruGreen® guy needed to leave me a personalized note. The physical move from Oak Park to Naperville, IL covered only twenty-three miles. The cultural move, however, was more like going from a hippie commune to, well, to an All-American mom-and-apple-pie suburb in all its suburbity. In Oak Park, where herbicides are only slightly less maligned than Agent Orange, my “if it’s green, it’s a lawn” attitude was applauded. In fact, if you’re not green in growing your green, you’d best not come outside until the sun goes down. Mine was a typical Oak Park lawn. In short, I pretty much ignored it. It got mowed once a week, fertilized twice a year with an all-natural lawn food, and was watered when it rained. Sure, there was grass in my grass, but there were also some dandelions and a little crabgrass. In the shady areas, there was some Creeping Charlie and even some nut sedge. It was all green, it all mowed. It was a lawn. In Naperville, lawn growing is a competitive sport. It’s not enough for the lawn to be green here; it should be a particular shade of green. A “good” lawn consists primarily of a single species of grass: Kentucky Blue. It’s really more of a dark blue green, but you get the idea. The problem is that Kentucky Blue is the Naomi Campbell of the grass world. It requires copious amounts of exactly the right kind of attention or it does the herbivorous equivalent of flinging a flip-phone at you. While a good Naperville lawn is a monoculture, mine is a veritable botanic garden of all that is low-growing and green. I’ve got Blue grass, of course, along with dandelions, some little creeping things, some other little creeping things, some ferny-looking creeping things, some thistles and lots and lots of clover. I like clover. Clover is the right color. In fact, I think white clover leaves are an even nicer shade of green than Kentucky Blue grass. Clover has really cute little flowers. When I was a little girl, I made wreathes and garlands of white clover blossoms. My daughter makes them now. Clover is even an indicator of nitrogen—the stuff that turns grass green—in the soil. The biggest reason I like clover, though, is the bees. Clover is perfect food for bees, especially honeybees. And honeybees are endangered. In grad school, I wrote an entire integrated lesson plan for third- through fifth-graders focusing on the importance of healthy honeybees to our food production capabilities. When I see clover, I see orchards full of fruit trees pollinated by happy little honeybees. Well, the clover died. And left a very large dead brown spot in the middle of my front lawn. I left the spot there, hoping my neighbor would feel terrible about defacing my property. He never mentioned it. Finally, one day I began raking away the old dead foliage, preparing the soil for seed. Now, I may not be the best lawn-grower in the world, but I know how to prep a seedbed. I finished the raking, watered the soil to soften it and left the soil loosening for the next day. Imagine my surprise when I found that the bare spot had been seeded over. My neighbor had apparently felt guilty after all. He didn’t feel guilty enough to plant decent seed, however. This became abundantly clear when the new grass came in fluorescent green. He told me it would turn darker when it got older. It did not. It merely got taller. Eventually, I had a three-foot diameter circle of glow-in-the-dark grass in front of my house. Because the fluorescent grass was also stiff, after I mowed it, it looked like someone had stuck bright green toothpicks in the lawn. I lived with the toothpick lawn for an entire summer. My only consolation was that my neighbor used the same cheap, crappy seed to spot seed his own lawn. While I had a circle of fluorescence, he had little tufts of bright green toothpicks through his lawn. The radioactive green grass has since died off, giving way to other things greener and hardier, including clover, but I’m thinking it may have altered the genetic makeup of my horticultural haven. Recently, my daughter came running into the house squealing, “Mommy! Mommy! I found a four-leaf clover!” Well, of course I thought she had smooshed two clover stems together to make them look like one four-leaf clover. But she hadn’t. In her hands, she held a perfect four-leafed clover. She gave it to me and ran outside to find more. “That’ll keep her happy for a while,” I thought, but she was back in the house in a matter of minutes. Turns out, one particular spot in my yard is full of four-leaf clover. 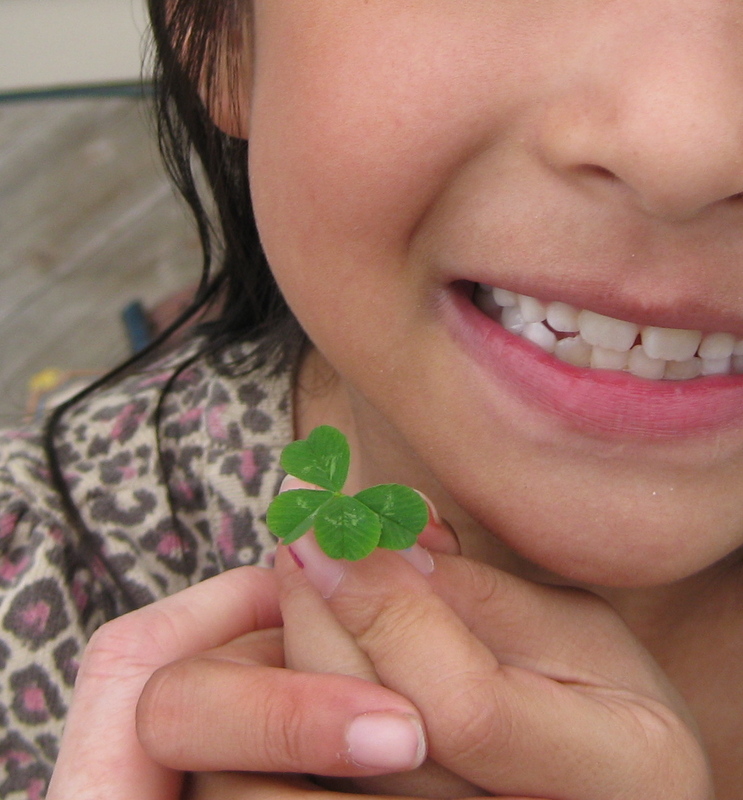 My daughter and her friend even found a five-leaf clover. I’m not a superstitious person on the whole, but I’m thinking the TruGreen® guy is going to have to find another yard to spray. In fact, the only way he’s welcome back is on his knees, looking for a six-leaf clover. Copyright 2011 by Janice Lindegard. All rights reserved.